We cannot display this galleryDuring the past week, I’ve been drawing a series of pictures featuring children and their parents shopping, for Grade 1 readers. It’s a fun little story, each child buying something that begins with the same letter as their name does. After a few thoughts about herding the children of our land into rampant consumerism, I got down and enjoyed drawing them happily shopping as if money was no object. What went through my head as I obsessively corrected little dots and tiny missing areas of colour here and there – (because on the drawing tablet I can blow up a line half a millimetre wide, to the width of my wrist and more), was that when ‘perfection’ becomes possible, it can become mandatory. To some extent I avoided that trap, hand-drawing for instance the pupils of eyes, instead of making a circle mechanically and clicking ‘fill’. (Okay I succumbed once. But just once.) I also became conscious that life-drawing is a Good Thing and should be practised often, the more the better. Sadly it’s something I don’t allow enough time for, and it would improve my draughtsmanship hugely, not to mention saving a lot of stress and doubt about how whether that hand looks right etc etc. To save time, the straight lines were done with two clicks and the shift button. But to use mechanical methods for curved lines is to remove a lot of the life from a picture. There needs to be a human touch, an imperfection, reflecting human fallibility. Sometimes the lines also got a bit wiggley here and there where my hand or my brain became tired or tense. That’s the intensely personal nature of drawing – the joy shows, so does boredom, so does tension, anger… oddly, some of my best work has happened when I’ve been sad and needed to make myself laugh. ‘Binnepret’ or inner fun, as the Dutch call it. This article by Tom Gasek, – Imperfection in Animation, confirms a lot of what I was thinking along these lines, while this project ran its course, even though he’s talking about stop-motion animation and not drawing, specifically. As for stop-motion animation – I also think there is a childlike self in all of us which secretly assigns a private life to everyday objects. Perhaps the animism practised by so-called primitive tribes has more to it than we know – for me, stop-motion brings that magic to life. 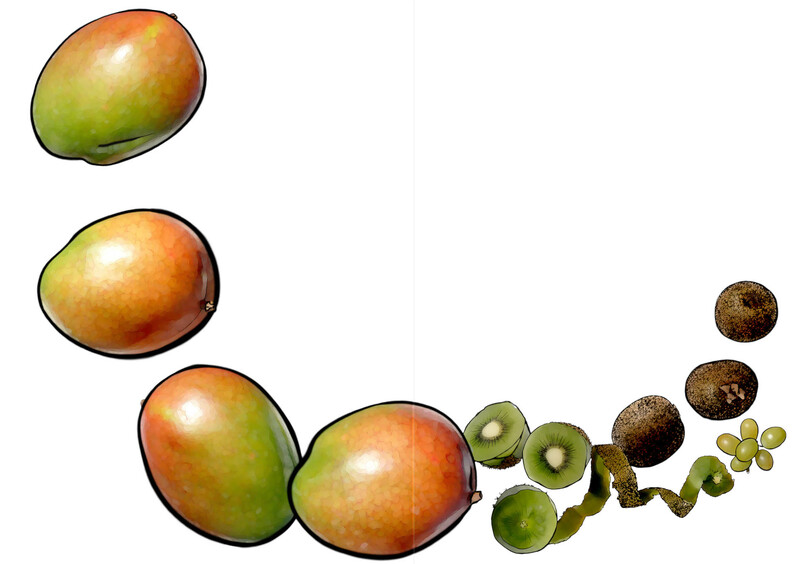 Here’s a heads-up from one of my latest jobs: a picture book all about fruit. It goes over two pages, hence the centre line indicator. View more pics in the fotomelt style here. There’s the Cape… and then there’s everywhere else. This is the Seasons series, which together with a collection of 6 types of weather and 8 birthday cakes, join the birthday months I featured last time, to inform the children in South African classrooms exactly what day, weather, season and month it is, and whether it’s anyone’s birthday. You can view them all, including the wall-hangings they are housed in, from this page. This clarifies the context in which these pictures were drawn and for what they were intended. I’m aware that the slideshow here is not in the correct order but WordPress has its limits, wonderful as it is. For a slideshow with the correct sequence, please click here. While drawing the pictures for this Midlands scene (summer rainfall) I became aware of a sharp homesickness. I’m really looking forward to going back to my roots and maybe the cosmos will still be blooming on the way to the Drakensberg sometime during April/May. I also plan to take my little tent so – good times beckon. We did two sets of Season cards, because the Western Cape has a Mediterranean climate with a Winter rainfall – that’s the set with the grapevine of course. Have to apologise for not posting very often – quite frankly because I didn’t think I had the time. But on my personal blog, Humble Hedonist, I’ve managed to (almost) stick to a daily posting and so it has been proved possible. I suspect this blog will have many more links to other people’s tips and wisdom, and because I’m an ardent futurist, to new and exciting inventions, technology and everything my fellow designers and illustrators may enjoy as well, not to mention my clients. Am excited about my latest project to go to print, i.e classroom teaching materials for very young learners, commissioned by Early Childhood Development. The favourite part for me was the birthday months, in which South African creatures of the wild cavort and celebrate the children’s birthdays occurring in the classroom for that month. This came about because I went to Huis Jabes in Brackenfell with Adin van Ryneveld, the NoMoneyGuy – (see more about him on Facebook) who’s started a group called Nubuntu. Similar to the African attitude of Ubuntu: ‘You are a person because of other people’, it seeks to put charities in touch with people who can donate their skills. Long story short – (well, I tried) – Adin went to Huis Jabes to video the various people involved and to discover the passion behind the work; I went because I’d voluteered to do their website and wanted to get a feel for the personality of the place. At the end of our time with these inspiring women, Adin wondered how he was going to get his little movies edited. I volunteered, since I’d edited an animation a year or so ago and brashly felt this qualified me to do this job as well. One learns. And after many puzzles and struggles to get music donated, finally I found mobygratis.com who cheerfully took 24 hours to give the nod to three pieces of music. I found them after waiting for two months for a crowd in New York…. no let’s not even go there. It’s 6 minutes 30 seconds long, and any feedback is welcome. I can only improve! The narrative is in Afrikaans, but English subtitles are provided. My websites moved to a new domain host this past week and it’s been tough. Who knew the process took so long? Not me. I thought it was an overnight thing. Not so. And so we learn. If you were inconvenienced by your mails to me bouncing back (yes, all sorts of ramifications happened that I hadn’t foreseen) please write me again. Picasso spent most of his later life trying to draw like a child. I didn’t have the faintest idea what he meant, until I was commisioned to enhance children’s drawings for a book called My Children’s Act, a massively difficult project and a huge achievement by Emma Attwell, who is herself the mother of two adopted children, both with different health challenges. Emma managed to simplify very complicated legislation to a level that children can understand, and produced a 48 page book which is appealing to any child. Many of the abuses in South Africa happen because the perpetrators count on the children’s ignorance of their rights and I believe this book addresses that problem. It was a privilege to work on it, and it certainly opened my eyes to the beauty in children’s drawings. There were drawings (for a subsequent poster) that I would have been keen to blow up to door size and hang on my wall. The lines are pure and beautiful and impossible to imitate. So I now know what Picasso was talking about. Some of the pages had to be illustrated by me, trying my best to cajole my inner child into action. But her efforts were ruined by my artistic training, which crept in constantly… even when I attempted one picture with my left hand. It took half a day, so I gave up on that, and went back to my right hand for the other pics, resigning myself to a reasonable facsimile of childlike simplicity. 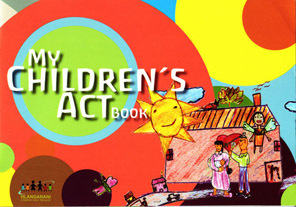 The book is available from Child Welfare Cape Town – contact them on 021 6383127. View the book and the efforts of the young artists by clicking on the image. This book is about a family fishing trip. I like it because it features black South Africans as ordinary, urban, successful people, instead of focusing on tribal culture (rich and interesting as that is), political issues, blah blah blah… well to be honest, I did insert an issue in that I made the heroine of the story a child living with albinism. It’s generally known that people living with albinism suffer intense discrimination at the hands of less pigmentally-challenged members of their communities in South Africa, and I thought it would be an effective way of getting people’s eyes used to the fact that they are part of our society. So let’s include them. 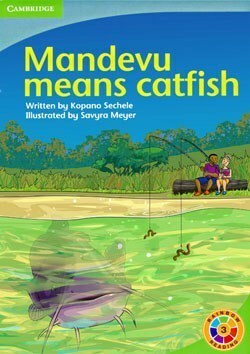 View Mandevu Means Catfish by clicking on the picture. 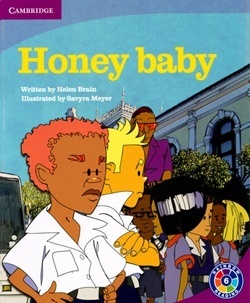 Honey Baby is a story written by the eccentric Helen Brain, a witty author who always provides an entertaining twist to her tales. This is the story of two naughty brats who break away from a field excursion organised by their school, and end up locked in a store room. This was the most enjoyable book I’ve ever illustrated. I’m not sure it was an accolade when the commissioning editor was pointed to me as the best illustrator for such a …. oops nearly spoiled the surprise… but anyway, am happy to have had the chance to draw these little brats. We all had a good time. Go take a look – by clicking on the Honey Baby image to view. I think it’ll make you smile. More than once, even. 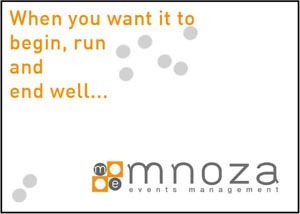 Also new on the site is a concept|script|storyboard for Mnoza Event Management, which was very enjoyable to do. Click on the Mnoza link to view the storyboard and how it turned out eventually.